Okuma is one of the top fishing tackle manufacturers around. They're known for high quality rods and reels. This guide will help you find the best Okuma reels for your needs. The philosophy behind Okuma reels is that a destination doesn't define fishing. Rather, fishing is what they call "an endless pursuit." As such, Okuma prides itself in producing fishing equipment that will support the journey. From amateur to professional, and from beginning to end. The reels, rods, and tackle that are developed by Okuma are meant to be the foundation of an improved, complete fishing experience. Okuma calls this “inspired fishing,” where equipment becomes something more. Their dynamic designs and materials represent motivation and drive to get up and get fishing. Okuma reels and rods can be found in 86 different countries. The Okuma brand is widely recognized as one of the top three fishing equipment manufacturers. When looking for the best Okuma reel for your fishing needs, it can be difficult to narrow down your search. This review will take an in-depth look at the top-rated Okuma reels that are currently on the market. Before looking at Okuma reels, make sure that you have a clear picture of the sort of performance that you expect from a fishing reel. Understanding which environment you will be fishing in will be important. Saltwater vs. freshwater angling can have very different requirements. The species you're after will also play a large role in the equipment you select. To provide expert guidance when searching for Okuma reels, we have compiled a comprehensive list of top reels. These reels have gained consistent praise from amateur users and professional anglers alike. Pro bass fisherman Scott Martin is a big believer in Okuma reels. He also pairs his reel with Okuma rods as well. 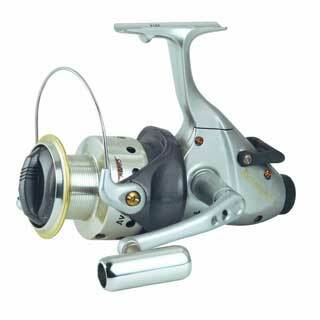 The Okuma Helios is a top baitcasting reel. If you're a fan of metal body reels. the Helios is for you. It features a die cast aluminum frame, side plates, handle and spool. Together this leads to a 6.3 ounce lightweight reel. But that's not all, the gears are also made of heavy duty aluminum for extra rigidity. It has 8 ball bearing and 1 roller bearing all made of stainless steel. For backlash control, it features a 7 position velocity control system that uses centrifugal brakes. The reel will hold 130 yards of 12 pound test and comes is 3 gear ratios. It's available in 6.6, 7.3 and 8.1 to 1 gear ratios. These different gear ratios will let you choose the retrieve speed that best suits your fishing style. ​This reel has some fantastic reviews. I'd love to get my hands on a left handed version, but have had no luck finding one. The reel was designed with the help of tournament pro Scott Martin. It's a great choice for intermediate to advanced bass anglers. Aluminum Frame and side plates. Almost all reviews are positive. Great for Largemouth Bass Fishing. Some users report that when the reel is new, the tension control may need to be set extra tight. The Okuma Avenger manages to rest in a unique category. It lies somewhere between a professional grade spinning reel and a revolving spool reel. This is because of their patented baitfeeding system. This system allows for the spool to become disengaged, allowing the fishing line to run freely without having to open the bail. This allows a fish to latch onto the bait and run without feeling the drag. Once the drag is engaged, the hook sets in and retrieval begins. For spinning reels, the baitfeeder feature is a unique and useful addition amongst Okuma reels. Once the drag is engaged, the hook sets in and retrieval begins. For spinning reels, the baitfeeder feature is a unique and useful addition. The lightweight spools are CNC machined, and are made from aluminum. The spools are also fitted with oil-soaked felt washers, to ensure that the spools can revolve smoothly and efficiently over time. With six different models and two gear ratios to choose from, anglers will find plenty of options when it comes to gear ratio, maximum drag, and weight of the reel. The Okuma Avenger ABF does have a watertight drag seal. This will make it less likely to have saltwater intrusion into the drag. Still, keep in mind that the vast majority of internal mechanisms are not sealed, meaning that saltwater could potentially damage the bearings and gears. Many reviews use the Okuma Avenger reel in saltwater, but stress the importance of prompt and thorough cleaning to prevent damage. Make sure you at least wash it down after saltwater use. Baitfeeder lets you frees spool your baits. Some users report early reel failure. May require re-greasing of gears. This reel is a left-handed crank line counter. It's one of Okuma's top line counter reels. This makes it great for trolling for salmon, lake trout or brown trout. It's made of a lightweight, corrosion resistant material. The mechanical line counter gives measurements in feet, and it utilizes a rubber push button for resetting. Setting line out to the same distance is an effortless procedure. This will help you make sure you're presenting your lures in the same depth zone every time. Not only does the Okuma Magda Pro offer an excellent line counter function, it comes equipped with a carbonite drag system. It also features rugged machine cut brass gears, and a self-lubricating gear system. The stainless steel level wind system ensures that the fishing line is wound back on to the spool evenly. 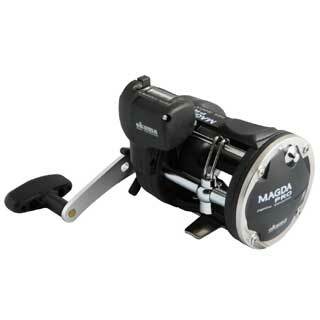 Overall, the Okuma Magda Pro Line Counter is a well-made and reliable reel. It can handle deep jigging and trolling equally well. Trolling reels aren’t made for casting, but this Okuma reel can be used to cast if need be. ​Because this is an open face trolling reel, the best way to make a cast will be to set the star drag to match the amount of casting weight. Of course, the best way to use this reel will always be for bottom fishing off a pier, or trolling from a boat. Good multi species trolling reel..
Can be used for saltwater trolling. Some users report stuck line counter. The Cold Water model is one of the most popular Okuma reels. We ranked it as one of the best line counter reels. The entire Cold Water line is based upon a powerful star drag foundation. It's supported by heavy duty brass gears and a full Carbonite drag system. With the ability to output 20 lbs. of drag, this particular reel model is incredibly powerful. The Aluminum ratcheting drag star enables trolling fishermen to set precise drag settings. The popularity of the Okuma Cold Water reel is partly due to its lightweight and high durability. The side plates and frame are made of corrosion resistant aluminum, protecting the reel from wear and tear due to water and humidity. Models in the Cold Water reel line are available for both left and right hand retrieve. Precise drag settings and a set of specialized retrieve options make the Okuma Cold Water model one of the most versatile trolling reels on the market. Okuma reels strive to be accessible to all anglers, and the Cold Water line is no different. Every reel in this series features left-hand and right-hand reel versions. This is a somewhat rare quality amongst fishing reels. It can be difficult to find a reel that is formatted for individual preferences. Luckily, Okuma reels make it much easier. Top line counter reel on the market. Handles lead core line well. Some users don't like the drag. Okuma reels are known for having unique configurations and efficient internal systems. The Okuma Trio High Speed spinning reel is the perfect example of this reputation. The hybrid spool design combines a graphite arbor and an aluminum lip. This provides enhanced protection and durability while preserving the overall weight of the reel. The spool is made of aluminum and graphite combined in a hybrid design. The body is made of high density graphite. Their patented Precision Dual Drag Force system utilizes both surfaces on the spool. This helps get the most out of high-end drag pressure. As a result, the reel has a much more efficient and smoother performance. 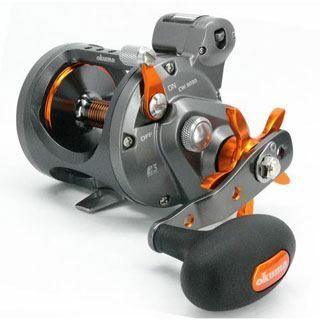 With 10 stainless steel ball bearings, anglers will be impressed by the overall strength and speed of this Okuma reel. The vast majority of reviews state that the smooth operation and powerful drag system are top features. Because this Okuma reel has such a powerful drag system, it is incredibly versatile. This is a great benefit for those who want to be prepared for a variation in fish species and size. Anglers who are aiming to hook small or medium sized fish will be happy to know that the reel can easily withstand long runs. Confidence in your equipment is key. Knowing you have a reliable reel is part of a successful trip. Hybrid aluminum and graphite spool. Some users report gear problems. Some users don't like the size of the bail wire. 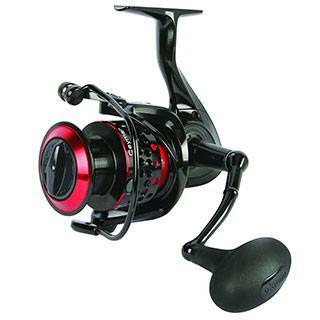 The Okuma Ceymar reel features an ultra-lightweight and fierce, stylish design. The reel features seven ball bearings and a patented Quick-Set anti-reverse roller bearing. This helps ensure smooth retrieves and a solid anti reverse engagement. It has a Narrow Blade Body Design and reinforced aluminum components. ​The Ceymar model provides great control and durability while keeping overall reel weight down to a minimum. Its unique design and lightweight nature make it a comfortable reel to hold for hours at a time. The strength of this Okuma reel is seen in the 18 pounds of maximum drag, making this reel well-suited for any medium to heavy fishing. Also check out the ultralight version. It made our list of best ice fishing reels. Professionals and amateurs alike have been heaping praise on the Okuma Ceymar spinning reel. It offers smooth and durable performance, and is a great value. It features a 5.0:1 gear ratio and 7+1 ball bearings. 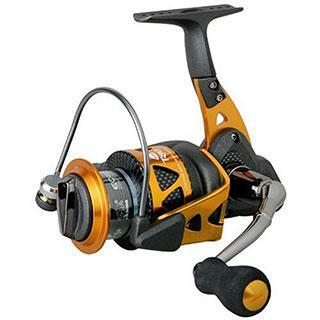 This reel also comes with an oiled felt drag system for smooth operation. Great for small to medium sized game fish. Handle is long enough for hands wearing large gloves. Gear ratio is a bit slow for some users taste. As a group, Okuma fishing reels offer high levels of technology and innovation. This makes them one of the most competitive brands available on the market today. Choosing the best Okuma reel for you means taking a close look at the top-rated Okuma fishing reels. Closely examining these highly praised reels can help pinpoint the best Okuma reel for your fishing needs. Whether you are looking for a trolling, spinning, or baitcasting reel. Anglers of all backgrounds and experience levels can rest assured investing in an Okuma fishing reel. Okuma is dedicated to accessibility, performance, and innovation.